Over 50 years ago we introduced the industry’s first single lever control systems, and we have been designing and manufacturing control systems for commercial marine vessels, yachts, and pleasure boats ever since. We have established a reputation for reliable, responsive control systems from the beginning and have continued to use new technology to our advantage. This is evident in our SmartCommand control system. ZF Marine’s state of the art control systems are designed for the harsh engine room environment and are available for both mechanical and electronic applications. Our control heads are built to withstand the harshest marine environment while being attractively designed to complement any application. What controls do you require for your application? ZF Marine offers a number of control systems that offer features for specific applications. 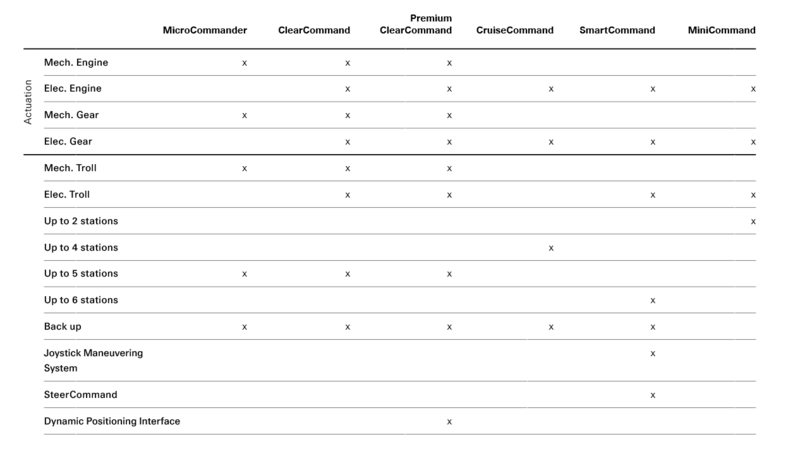 The chart below will allow you to better understand what control system will best suit your needs. Plug-in Installation – ZF Marine control systems utilize plug connectors that make installation easier and cut installation time significantly. Determine cable length, engine and transmission requirements, and you’re ready to plug in our systems. To simplify things further we can provide custom designed kits for production boat builders. Push Button Set Up – Configuring the parameters for your controls has never been easier. Simply enter the parameter code and the processer instantly makes the correct adjustment. Changing configurations later to meet a new specification is just as easy. Start Interlock – Our neutral start interlock prevents engine start up unless the control system is on, in neutral, and a specified station is in command of the engines and transmissions. Emergency Reversal Protection – Speed / shift sequence protection allows shifting from full ahead to full astern in one motion while preventing damage to the engine or transmission. Designed with safety in mind, this sequencing technology allows you to respond safely to emergency situations. Synchronization – Engine synchronization is standard on all control systems. Synchronization automatically maintain the same speed on multiple engines, thereby increasing operating efficiency, improving fuel economy, and reducing noise and vibration. Synchronization also allows for one lever operation – allowing the control of multiple engines and transmissions with one lever. Multiple Control Stations – All control systems have the capability to support multiple control stations on a vessel including our optional handheld control. Built in Processor Displays – All control system processors feature digital displays that provide information for set up, system status, and diagnostic purposes. Troll – All our control systems are designed to control mechanical or electronic trolling valves as well as ZF AutoTroll. A full range of shaft speed is available below engine idle without the need for additional switches. If you would like to request a control quote, please click here.